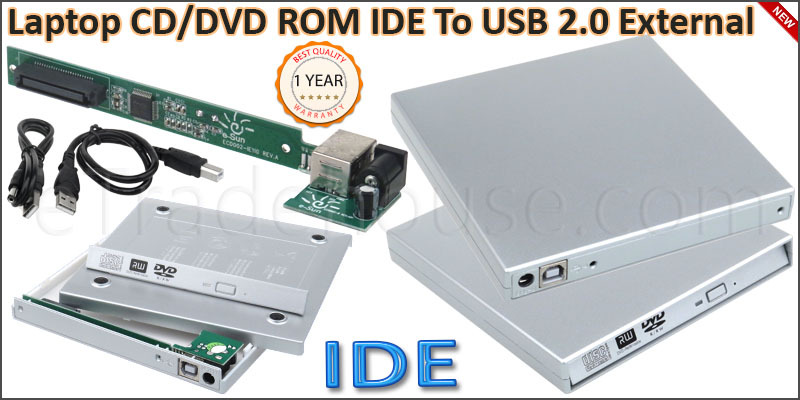 High Quality Laptop CD/DVD ROM IDE To USB 2.0 External Note: This is only CD DVD RW Case Cover, It doesn''t include any CD or DVD RW. It converts the Laptops optical CD-RW, DVD-RW, BD-ROM drive, to external CD-RW, DVD-RW, BD-ROM optical drive which connects to the USB port of your Laptop. It does not require any external Power as the CD-RW, DVD-RW, CD-ROM Optical Drive will powered through the extra USB Power Cable provided within the package. Enhance your laptop with this external USB 2.0 slim line case. Supports slim line laptop CDROM/ CDRW/DVD-ROM/COMBO drives. This laptop accessory is very easy to install and use. Fits all 50-Pin laptop drives(CD ROM,CDRW, CD COMBO, DVD ROM,DVDRW +/-). Fully backward compatible with USB 1.1(12mb/sec). Compatible with all USB ports. An extra cable is included which can draw additional power from another USB port. Any kind of optical drive is not included in the package. Supported Drives: DVD+R, DVD+RW, DVD-ROM, DVD-RW, DVD-ROM, CD-R/RW, CD-ROM Casing supports USB 2.0(480mb/sec). Operating System Support: Windows 98SE, ME, 2000, XP, vista, Win7 & Win8. .
1x IDE Laptop CD/DVD ROM External Enclosure case. 1x USB 2.0 data cable. 1x USB 2.0 extra power cable.